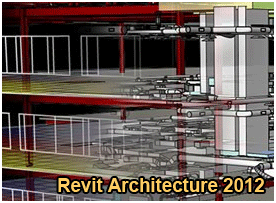 Our Revit Architecture 2012 training course offers 25 hours of instructor-led video based training. The program covers beginner to advanced BIM features and functions, including modeling system family elements, placing components, creating views and sheets, controlling the appearance of views, adding dimensions and constraints, creating reports and schedules, and using collaboration tools to work with others. Utilize our Revit Arch 2012 training to help design and shape the world around you by learning to effectively use this leading CAD program. Explore ideas more intuitively in 3D, speed documentation, share ideas seamlessly, and customize for your specific needs. With over 270 lessons and demonstrations, you will find this training dvd covers a variety of topics to teach you how to effectively use the Revit Architeture software.